I've already done a game this week, but inspired by the sheer ignorance of (mostly US) so called gamers I felt the need to bring another forgotten classic to your attention. I'm so sick of hearing how Nintendo saved gaming! At the very same time Nintendo were single handedly saving an entire industry, I was playing a rather interesting game called Little Computer People which is also sometimes known as A House on a disk. The game was released in 1985, when lets not forget, gaming was "dead." It was available on a number of systems including the Apple II. 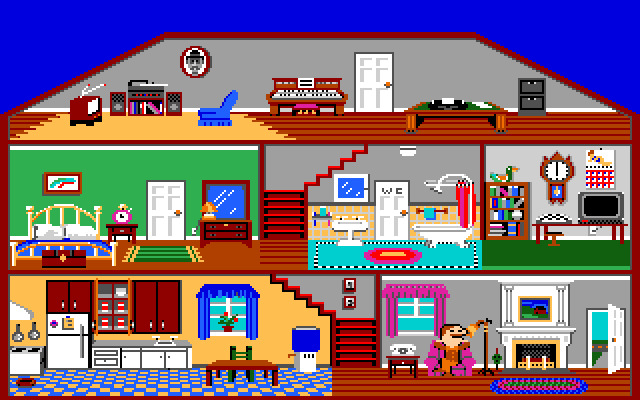 The game is basically The Sims, but obviously limited by the hardware available back then, it was groundbreaking at the time and was the first commercially available life simulation game. The Sims creator Will Wright has gone on record to state how this game influenced his creation. The graphics across all systems were nice enough, and the AI and gameplay were superb. You can do a lot of things in this game, interact with your character and even play poker with him! It was so far ahead of it's time it was not beaten until the release of The Sims 15 years later. Nintendo eventually got a port made for their NES add on, the Family Computer Disk System, which obviously helped them save the world. At the time of release it get's a 10/10 for me, in terms of innovation and influence it's right up there. Nowadays it can't keep up with the latest Sim games and all their gameplay advances, but there's still something that's immensely fun with it's sheer simplicity. I give it 6/10. With all the emulators for old systems available now, take your pick on which version to play. My favourite is the Commodore Amiga version. Very colorful behehe, do you build the house or just mess with the people? You just mess with the people. No 2 were ever the same btw, each persons game generated their own character. Cool, I think that's what is missing from the Sims, that simulation\experimentation feeling of these older games. Mingle Forum by Cartpauj | Version: 1.1.0beta | Page loaded in: 0.106 seconds.